After staying up many late nights for the Olympic figure skating competitions, I’ve decided that I am either getting too old or the competitions were on way too late for working adults to watch and not look like zombies the next day. That said, I thoroughly enjoyed all the figure skating that was on tv the last two weeks. I also loved that everyone and everything seemed to be about figure skating on tv, magazines, talk shows, twitter, facebook, and blogs. It was like being treated to a buffet after being on a long 4 year fast! I’m so used to only having an hour or two of skating on every couple of weeks that I think I’ve gorged myself. I’m on figure skating overload and I LOVE IT! That’s not to say that there weren’t a few moments when I felt really cranky watching the press light up with the ice dancers Aboriginal costume drama, the Weir “anti-fur” hate articles, or the constant debate on whether figure skating was really a “sport” due to the Plushenko quad debacle. It also does not mean that I didn’t feel that the judging wasn’t without its bias as far as the ice dancing and singles competitions. I thought I was going to have a heart attack after seeing Johnny in sixth after perfect short and long programs and I really did throw my pillow at the tv after seeing Tanith & Ben placed in fourth behind the slowest and sloppiest Russian free program I have ever seen. Fast forward to the ladies competition and I was stomping out of my living room when Rachael Flatt was downgraded too harshly for her jumps and Mirai was placed in fourth after two inspired programs without a bobble to be seen. Those aspects aside, there were also moments when I was completely inspired. When both Shen & Zhao and Evan Lysacek won gold you knew they had earned it with hard work, determination, and perseverance. Equally inspiring was Weir’s clean short and long programs where his personality finally shone through after years of inconsistent skating and training. 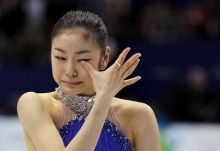 I also cannot forget Yu-na’s beautiful long program finale when she wept on the ice in relief and happiness. Finally, Joannie’s struggle to compete after the loss of her mother and her rise to the top was a magical moment for many (although I cannot completely agree with her placement I do think it was a gorgeous program for her). These are all wonderful moments in this year’s Olympics, which I am sure will be remembered by fans and non-fans alike. Despite all this coverage I still crave more figure skating! The best part of this olympic skating smorgasbord is that it has hopefully inspired a new generation of adults and kids to skate and has revived a waning interest in a sport that is as controversial as it is beautiful and athletic. Let’s hope people are more inspired by the beauty of the sport and not the drama and that the interest lasts until the next Olympic smorgasbord of figure skating. With the Men’s figure skating competition only a few hours away I find myself writing this blog post. I’ve been watching all the Olympic coverage, listening to the tweets and chatting around me and I just can’t help myself! I’ve got to add my two cents into the mix. First, I think this competition is going to come down to who has a quad and who doesn’t. I do believe artistry and other technical elements will play a major role in determining the winner of this event but when you get right down to the facts, the quad is going to be the deciding factor. I haven’t really seen Plushenko skate, but I’ve seen him compete in the past and he has nerves of steel. He also has two quads planned for his long program. That’s some serious competition. If he skates like he did in the past, Evan Lysacek will have his hands full. I do believe Evan Lysacek will be a strong medal contender and may stop the impeding Russian from dominating fully. Jeremy Abbott, to me, is the wild card. He is a brilliant skater but can he hold it together through both the short and long? Does he have the nerves? Because if he skates like he did at nationals he’s got a great shot at being a medalist. Then there is our Johnny Weir. I LOVE Johnny Weir. Yes, and much like his reality show’s moniker, you either love him or hate him. I’ve always enjoyed his skating, he just glides and flows when he is on. If he can land that quad he has a chance at medaling however I think it might be a long shot. I definitely feel that he will be top 5 but can he hold off Plushenko, Lysacek, Lambiel and Takahashi? I’m rooting for him and I believe he will place well in the short but it will take an immense effort from him to land that quad and deliver that beautiful long. Tonight’s short program will be very telling as far as who is on their game and who is not. Nerves, will play a big factor in deciding who is on top. My predictions? I think I am gambler at heart because I like to lay it all on the line for everyone to see, good or bad! Like my predictions for Nationals, I don’t pretend to be an expert here. In the end I think its any man’s game tonight to win or lose. They are all so close and so good! Watch NBC tonight at 8pm eastern for the Men’s short program coverage. Have a prediction? Send it via Twitter via@dream2skate. I’ll post all predictions here.